More than a million learners from 150 countries have already enrolled in the University of Leeds' online courses. The University has now identified a trend towards full online degrees. The University of Leeds is one of the most active institutions in the field of digital education in Europe. On the FutureLearn platform, they have been offering online courses (MOOCs) since 2013. One million learners (and counting) from more than 150 countries have already participated in their courses. The University has recently identified an 'explosion' of online accredited courses and full online degrees and plans to be part of this development. We have interviewed Professor Neil Morris, who leads the university's Digital Education Service. "A World Leader in Digital Education"
Edukatico: Dear Professor Morris, what is your institution's overall strategy in the field of digital teaching? What is your motivation as one of the most ambitious universities in this field in Europe? Professor Neil Morris: We have a clear vision to empower the University and its partners to provide learners with high quality, professional and educationally robust digital education opportunities. We aspire to be a world leader in digital education, offering flexible, accessible online learning opportunities to our campus-based and online students and to learners all over the globe. 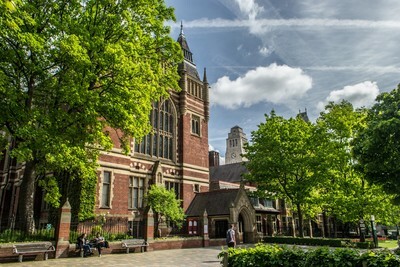 The University of Leeds launched its first online course, developed by the Digital Education Service team, on the FutureLearn platform in 2013. Since then, courses developed by the team have been used and enjoyed by more than a million learners worldwide (the number of enrolments on all courses so far is 1,037,593, from more than 150 countries). The University has already created online modules for partner organizations and 48 free online courses (MOOCs) on FutureLearn. In addition to working with our academics, the Digital Education Service has also successfully partnered with a wide range of external organizations to co-create online courses. These include the BBC, the Goldman Sachs Foundation, the Institute of Chartered Accountants for England and Wales, IBM, and Marks & Spencer. "Growth in Online Learning is Inevitable"
Edukatico: Some years ago, there were discussions whether universities would disappear because of MOOCs. This has obviously not been the case, so what do you think the role of online learning will be in the future of higher education? Professor Neil Morris: There is an inevitable growth in online learning, due to the increased availability of Internet-enabled digital devices among the global population and the massive increase in digital learning resources available online. This includes Open Educational Resources, online content, online courses, credit-bearing courses and full online degrees. The demand for online learning is growing annually, throughout the formal and informal education system, and for continuing professional development within the workplace. Schools, universities and employers are all making increased use of online learning materials to support learners and to increase flexibility, access and engagement. Often, digital learning resources are used to support a “blended learning” model, where online content supplements and enhances activities in the classroom. However, there is also large growth in purely online learning, in the form of accredited courses, qualifications and full online degrees. These full online offerings support individuals who are not able to access the traditional education system, or who need flexible learning opportunities, as a result of work, personal responsibilities or other reasons. "An Explosion of Full Online Degrees"
Edukatico: Your institution is one of the first universities to offer the opportunity to earn academic credits with MOOCs and similar online courses that count towards degrees. Will there be more online university degrees in the future? Professor Neil Morris: Alongside the Open University, we began to offer undergraduate credit-bearing courses on FutureLearn in 2016. These courses were designed to allow individuals to get a taster for university education, which they could use to support a university application, or to use as professional development. Since then, there has been an explosion of online accredited courses and full degrees on the FutureLearn and Coursera platforms, from a number of world-leading universities. In addition, increasing numbers of universities are offering full online degrees (often at Masters level) which can be studied on university systems (e.g. University of Leeds Engineering Masters degree). The growth in full online degrees is a trend that looks set to continue. Edukatico: What group of online learners do you target with your courses? Would you like to see more learners from specific backgrounds our regions participate in your online courses? Professor Neil Morris: We offer online courses for a wide range of audiences. They mainly fall into the categories of general interest learners and lifelong learners; prospective university students (school children); current undergraduate or postgraduate students; employees seeking continuing professional development; and professionals with a specific interest. We offer a large range of ‘schools courses’ on the FutureLearn platform in a range of disciplines, which run every single month. These courses are intended for school students who are interested in a specific topic, and wish to get a taster of university level learning. We would love to see more school children, and their teachers using these courses, as they offer great knowledge training and skills development. Edukatico: The University of Leeds already offers various science, medicine and business courses via FutureLearn. On Coursera, you will now offer an engineering course series. Will you offer courses from further subjects in the future? If so, what will be the key subject areas for online learning? Professor Neil Morris: Our online course portfolio reflects the breadth of the University of Leeds, which has research and student education expertise in many disciplines. We are currently developing further online business, STEM and health courses, which will be available on the FutureLearn and Coursera platforms in the near future. Edukatico: Thank you for this overview and all the best for your various online course programs! In addition to their existing online courses via FutureLearn, the university has now launched a new engineering course on the Coursera platform. This course is part of a series that leads to the award of academic credits that can count towards a full MSc Engineering Management online degree from the University of Leeds. The opportunity to pursue full academic degrees online is currently being developed on the Coursera and FutureLearn course platforms. EdX offers the possibility to earn some course credits towards a Master's Degree. Our course directory contains 7,000+ video-based online courses from 22 subjects. If you're interested in online learning, register for our newsletter here. And follow us on Facebook and Twitter!